Red Yeast Rice – Rice that has been fermented by the yeast Monascus purpureus has been used in Asia for centuries as a food preservative, food colorant and flavoring, as well as in traditional herbal formulas. It is part of the diet in China, Japan, and Asian communities in the United States. Jarrow Formulas ® uses Red Yeast Rice that is carefully fermented to avoid the presence of citrinin, a naturally occurring mycotoxin. 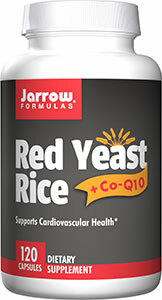 Coenzyme Q10 complements Red Yeast Rice in supporting healthy cardiovascular function.